The role of lateral extra-articular tenodesis (LEAT) as an augment to primary anterior cruciate ligament reconstruction (ACLR) remains controversial. However, concerns exist regarding the risk of development of osteoarthritis due to over constraint of the knee. 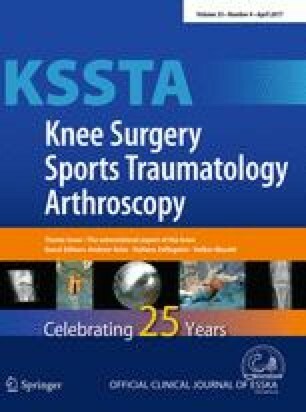 To systematically review the literature to analyse the long-term incidence of osteoarthritis in patients who had an LEAT performed in isolation or in combination with intra-articular ACLR for the treatment of ACL deficiency. Two reviewers independently searched five databases for randomized controlled trials (RCTs), non-randomized comparative, and retrospective cohort studies (CS) with long-term radiological follow-up of patients with ACL deficiency treated with ACLR combined with LEAT or LEAT in isolation. Risk of bias was performed using a modified Downs & Black’s checklist. The primary outcome was the development of osteoarthritis. The studies were divided into those with moderate/severe osteoarthritis at between 5 to 10 years and >10-year follow-up. The rate of meniscal pathology at the time of the index surgery was recorded. A best evidence synthesis was performed. Eight studies reported on 421 patients in which an LEAT procedure was carried out. There were two high-quality RCTs and six low-quality CS. The follow-up was between 5- and 10-years in 5 studies and >10-years in 3. The presence of moderate/severe osteoarthritis was not detected in three studies and was found in 4/44 (9%) and 13/70 (18.6%) patients in the other two. At 11 year follow-up, one study demonstrated no osteoarthritis, while the other two studies reported rates of 54/100 (54%) and 17/24 (71%) respectively at >24 years. In the latter two cases, the rate of meniscal pathology was >50%. A best evidence synthesis revealed that there was insufficient evidence that the addition of a LEAT to an ACLR resulted in an increased rate of osteoarthritis. The best available evidence would suggest that the addition of a LEAT to ACLR does not result in an increase rate of osteoarthritis of the knee. In knees that have undergone a combined ACLR and LEAT, the incidence of osteoarthritis was low up to 11 years but increased thereafter. The presence of meniscal injury at the index surgery was reported to be greater predictor of the development of osteoarthritis. None of the authors declare that they have any conflict of interest related to this work. This article is a systematic review and does not contain any studies with human participants or animals performed by any of the authors.